Singer-songwriter Tom Guerra spent 15 years with the band Mambo Sons before the band called it quits. During their time together, the band released 4 albums of Indie Rock And Roll. The 4 albums included the last release of Heavy Days, which turned out to be a 2-CD set of music. With Mambo Sons no longer together, Tom Guerra turned his attention to creating his own music. Not surprisingly, Guerra’s sound and style picked up right where Mambo Sons left off and therefore, Guerra’s music contains the same Indie Rock feel of his old band, but with a lot of other influences thrown in as well. Not that long ago, Tom Guerra created his first solo album, 2014’s All of the Above. With Guerra now being a solo artist, he called upon several other people to help bring his music to life. Throughout the disc, Guerra performs both the guitar and bass parts on all of the tracks included on the release. But to bring the songs life, Guerra is joined by Mike Kosacek on drums, Morgan Fisher on piano, Matt Zeiner on piano, clavinet and Hammond B-3 and Christian Guerra adds vocals to a few of the tracks. All of the Above from Tom Guerra begins with the track “Get offa My Groove”. With the track having a strong rock feel to it, the “groove” created by the musicians on the track is very strong and sends the style of the track back a few decades. In fact, the track seems to have a definite Rhythm and Blues approach to it. The track’s strong musical feeling helps to kick off Guerra’s new release in a big way. With the next track, Guerra changes direction in his music. On the song “Simple Song,” Guerra and the rest of the band creates a track that brings to mind rock and roll from the era between the British Invasion and Disco where many rock artists of that time would have fallen into the style known as Glam. The Glam style of rock and roll produced on the track of “Simple Song” is even reminiscent of the musician Marc Bolan and his band T-Rex. The “simplicity” found in the song’s lyrics along with the guitar work by Guerra on the track help provide that “Glam” feel to the track. On the third track of the album, Tom Guerra doesn’t seem to travel very far from the Glam ear of rock and roll as the next song of “Dirty Son” finds Guerra creating a track that could very easily have been inspired by Rock and Roll Hall of Famer Joe Walsh. The track seems to contain the signature guitar playing of Walsh and the song has a sound that will remind you of material created by Walsh in the late seventies/early eighties. In fact, the track sounds like it could actually have been an outtake from But, Seriously Folks. The track features Guerra creating guitar work that all but screams Joe Walsh as it brings to mind images of Walsh’s style. The song itself has such an infectious sound that it could easily be a single. With the track “Here’s Tomorrow,” Guerra creates a track that also features a very distinct sound. What is featured in the music of “Here’s Tomorrow” is a style of rock and roll that existed right around the time of the “Summer of Love”. The track features rock and roll that includes a definite folk influence to it. The song will remind many of bands like The Lovin’ Spoonful and The Byrds. The lyrics also have a feel that will bring to mind that era of music. While the track “Here’s Tomorrow” features a folk-rock sound, the track “Queen of the Autumn Moon” goes in a different musical direction from that same basic musical era and features a very psychedelic feel to the music. The guitar work on the track adds a lot of reverb to the song and is truly one of the strongest highlights of the track. The lyrics and vocals of the song both bring to mind Ziggy Stardust-era David Bowie and each of the various musical elements of the song blend together to create one of the hardest rockin’ tracks of the release. Although many of the tracks that appear on All of the Above from Tom Guerra find the musician using the various musical influences he picked up from the many different styles and periods of rock and roll, Guerra is also quite able to hang with blues musicians as well. The listener can easily hear that blues influence on the track “Refrigerator Blues”. The power blues-style of music heard on the track bring to mind musicians like Stevie Ray Vaughn and maybe even Lenny Kravitz. While the track is blues-inspired, the rockin’ quality of the music fits nicely with the rest of the release. Just like with his former band Mambo Sons, Tom Guerra continues to create songs that change from tune to tune. In fact, Guerra seems to find his style by not staying in one musical direction for very long. 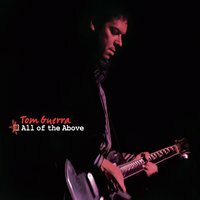 And by going from rock and roll to folk-rock to power blues and back again, the ever-changing sound of the music on the 2014 release of All of the Above allows the listener to hear many different sides to Tom Guerra’s talent as a musician. And with the music changing as often as it does, the listener finds a quality release that needs to be heard from beginning to end. So put All of the Above from Tom Guerra on and just enjoy the experience of it all.